Banner Magic! is the latest magic product created by Michael Mode. 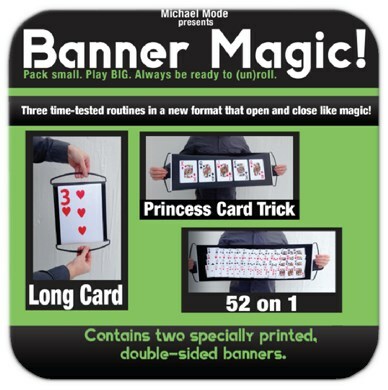 Designed for professional magicians, Banner Magic! is three time-tested routines, Princess Card Trick, 52 on 1 and The Long Card, in a new banner format that opens and closes like magic. The perfect prop to have on hand when you need extra performance material. Pack small. Play Big. Always be ready to (un)roll. Princess Card Trick - Your audience thinks of a playing card and you cause it to disappear. A great interactive effect for big groups or close up situations. 52 on 1 - The hilarious gag updated to pack small and play BIG. Have somebody think of a card and you're guaranteed to get it right! Long Card - Another hilarious routine that packs small and gets BIG Laughs! A selected card is revealed in s very funny way when the wrong card visually becomes the card selected by a spectator. Banner Magic! comes packaged in a reusable compact storage case. Community questions about Banner Magic!